Our apologies for the inconvenience. Please email your feedback to Community Relations at valdezc@metro.net, and we’ll also mention this issue and hopefully work on resolving it. if my employer participates in the B-TAP program, can i signup for the TAP CARD and use the tap card on the Blue Blue bus ? I’m not sure — let me try to get an answer for you today. If the employer is participating in the B-TAP program, then all of their enrolled employees will receive a personalized TAP card with their photo imprinted onto the card. 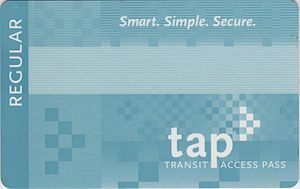 This card can be used to board all metro bus and rail 24/7, for as long as the employer and employee is enrolled in the TAP Employer Annual Pass Program. Please note, it is only valid on the Metro system. The employer may also enroll in the A-TAP program, which is valid on Metro, as well as all of the muni operators. The employee will also receive a personalized TAP card under this agreement, as well. I recently discovered the Source and I’m excited to see the strength in LA’s efforts to become a more efficient, cleaner, convenient and livable city. I was introduced to the site by the coverage of NoHo development site, I was wondering if this site is directly linked to Metro? I think there’s valuable input from commenters that might provide useful in Metros decisions for development and other measures. I recently got a new TAP card which has a design pretty much the same as the old design (old design here: http://la.streetsblog.org/wp-content/uploads/sites/2/2011/09/300px-TAP_CARD_001.jpg) except that on the bottom right corner the words “TRANSIT ACCESS PASS” are not there anymore. Everything else is the same, it’s not the new design with the yellow and red spots. Just wondering if you happen to know when this subtle design change was made? Thank you! Quick question on the Silver line between San Pedro and DTLA – does it run in regular freeway traffic or does it run in dedicated lanes? It runs in the ExpressLanes with other traffic most of the way. As a West Side resident I’m very much looking forward to the opening of Expo 2. While it’s great to see that the pre-revenue service has begun I’m surprised to see how many very old and noisy rail cars comprise its rolling stock for their newest line. Does Metro have a threshold for noise coming from it’s rail cars, especially as they pass through residential areas. How much noise would be considered “too much noise” for a home that’s track adjacent? Very good question. I think it boils down to this: There is no set limit in terms of decibels; it’s done on a sliding scale with more leeway given to places that have more existing noise. The way these projects are studied is to determine the existing noise and then to determine how much noise the train would add. If the trains are deemed to add a moderate or severe amount of noise, the agency building the project is expected to add mitigations to help reduce the noise. Noise was evaluated as part of the project’s environmental study. You can read that part of the study here: http://www.buildexpo.org/phase2/Phase%202%20FEIR%20Documents/03-12_NoiseandVibration_FEIR.pdf. It has info about noise and vibration although it’s on the technical side. As for the older rail cars, they are being replaced by new light rail vehicles that Metro has ordered. Those vehicles will be delivered to Metro and placed in service over the next few years — it’s a slow process. Thank you Steve, it does help. I’m familiar with the document you posted but both it and your answer overlook the point of my question. What happens when the noise registers at a “severe” or higher level AFTER the mitigations are in place* (e.g. a soundwall)? What does Metro do then? And are you saying that eventually ALL the rail cars for Expo will be new? Metro staff has already provided all info to Google maps, it is up to them to update servers. Is there a way to see future service alerts with the new website? I click on the Alerts and Advisories tab and it shows me list of bus and rail lines but when I click on the line nothing comes up. I used to use the rail pretty frequently on the weekends but wont be able to anymore if I cant check if there will be disruptions to my trip. I’ll have to go back to the car.